The sixties in Newport, Kentucky were a time of great change. The community was in transition as long-time residents were moving out to the suburbs and in their place, began a migration of poorer people, many from Appalachia. Most of them were unprepared for living in an urban setting. No agencies or community centers existed to meet the needs of these people, particularly the neediest cases who were without work and struggling to survive. One person, Reverend Bill Neuroth, the assistant pastor at Corpus Christi Church in Newport’s West End saw the need and responded to it. 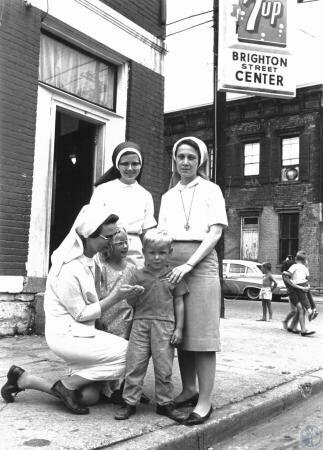 In 1966, he founded what was called the Brighton Street Center in a small storefront on the corner of 8th & Brighton Streets. It was a humble beginning and, in the first year, the Center was opened only during the summer and offered recreation programs for children in the neighborhood. In 1968, the Center was visited by two professors from the Social Work Department of Catherine Spaulding College in Louisville. They conducted a study of the Center and recommended future activities. Based on that study, the first emergency assistance and community organizing programs were started. Also in 1968, a college student named Bob Brewster began volunteer work at the Center. A few months later he became the Center’s first full time employee, assigned to youth gangs and the emergency assistance program. In 1969, Reverend Neuroth left the Brighton Street Center to pursue graduate studies in St. Louis. In late 1969, Bob Brewster became the director of the Center. Initially, Brighton Center was funded along with other community centers in both Covington and Newport. But in 1970, Brighton Center became an official United Way agency. Its total funding from the United Way in its first year of affiliation was $10,000 out of a total budget of $25,000. Its work in these early years was also aided by VISTA volunteers and neighborhood Youth Corps members. Before Christmas in 1970, Brighton Center experienced a turning point. Within the span of a few days, its aging and decrepit building at 8th & Brighton Street lost its furnace, was robbed of office equipment and vandalized. The Center made it through the Christmas season that year, thanks to the donation of a typewriter, food, clothing, and space heaters for emergency needs. Early in 1971, a mailing went out from the Center to all churches in Campbell County requesting their help in establishing an independent support arm to raise funds for a new facility. That led to the formation, in April 1971, of the Brighton Center Guild. The Guild’s first fundraising event was a Tasters Luncheon, held in the summer of 1971. It was followed by a benefit in September featuring Uncle Al of Channel 9 and a dinner/dance benefit at the Beverly Hills Supper Club. By Fall, Brighton Street Center had acquired new quarters just four blocks east of the original address. The donations from the Guild and other efforts toward the purchase and renovation of the building were significant. All the rehab work was done by volunteers, and by the following spring, the building was dedicated. The name became Brighton Center. Even though the facility was located a few blocks from its Brighton Street beginnings, “we didn’t want to forget where we came from,” says Brewster. To this day, some people still refer to us as the Brighton Street Center. 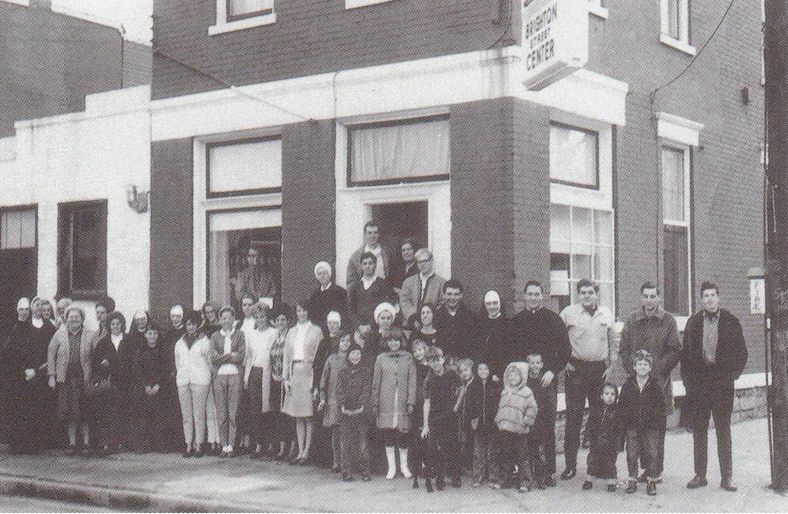 The Brighton Center Board was formed in 1970 and immediately began to have an impact by helping the Center expand in to serving the entire community. In 1976, the Center began for the first time to serve people in the East End of Newport from an office in the basement of St Mark’s Lutheran Church at 8th & Monroe. In 1979, Brighton Center established a more permanent presence in Newport’s East End when it purchased Dora Cummins School. As a result many programs were moved to the site in July 1980. The decade of the ‘80’s saw the most dramatic expansion for Brighton Center, both geographically and in number of programs and services. Appropriately, one of those geographic moves took Brighton Center back to its roots on Brighton Street in Newport’s West End. In 1983, we opened the Two Rivers Apartments, a 70 unit housing facility that served the elderly and handicapped. It is located on the block bound by Brighton, Patterson, Elm and 7th Streets, and just a block from the site of the original Brighton Street Center. 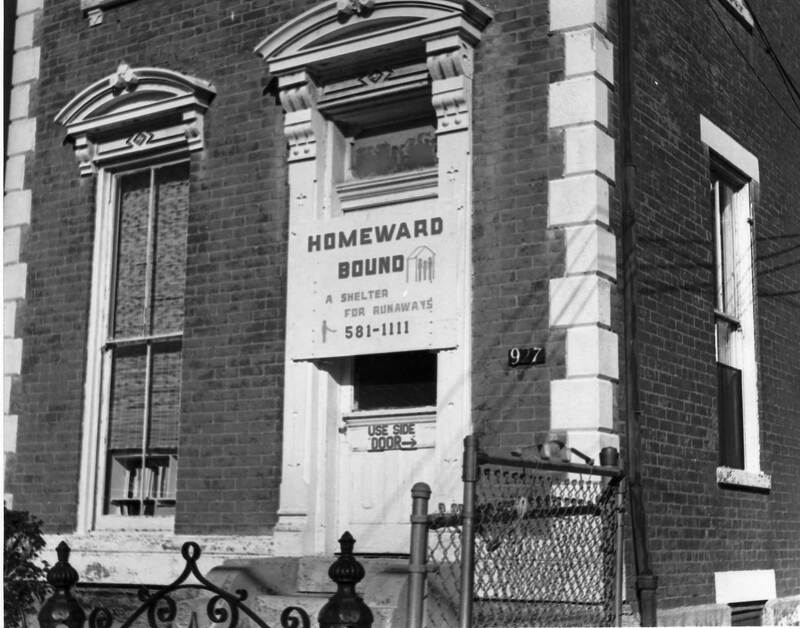 The mid 80’s also saw the development of the Homeward Bound Runaway Shelter, a program initially begun in Newport and later moved to Covington. This shelter provides services to youth. Homeward Bound also spawned additional youth programs in the ‘80’s including the Independent Living program and the Safe Place program, which offers children who are running away a safe access to available services. In the Spring of 1986, a disaster hit the Northern Kentucky areas, clearly showing the role of Brighton Center as an aide to the community. A tornado smashed into the area doing significant damage, especially to the West End neighborhood of Newport. In the aftermath of the tornado, Bob Brewster recalls “Brighton Center became a focal point for that emergency effort”. Employees, many of whom had been trained for disaster by the Red Cross, worked around the clock for several days to ensure that basic food, clothing, and shelter needs were met. Bob recalls “we didn’t ask for help. It just came. Cars began pulling up at Brighton Center locations loaded with boxes of clothing and food. Brighton Center really became a conduit of help to those who needed it throughout Northern Kentucky.” For Bob, the importance of Brighton Center and its service to the community was confirmed during that spring. At the end of the ‘80’s, a new West End building was constructed across from the 8th & Central location that had served for 17 years. The new facility was constructed as a result of a major Capital Campaign that drew contributions from individuals and corporations throughout the region. In the Spring of 1994, Brighton Center’s programs were linked through a Family Resource Center model of service delivery. The goal of the Family Resource Center is to help low income and at risk families become economically self-sufficient. Our “one stop” approach made services more accessible and acceptable and provided a continuum of services both within Brighton Center and through referral. The model was preventive and proactive, holistic and developmental, and encouraged individuals to assume maximum responsibility for their own lives. It was predicated on the idea that people represent a resource to be cultivated not a problem to be solved. In 2003, a new Family Center was constructed in the West End of Newport and the Administrative staff moved to the 8th & Central location. The Brighton Recovery Center for Women was developed in 2008 and Financial Services became its’ own department in 2010. Retired Executive Director, Bob Brewster reflects “We have moved far beyond just meeting basic emergency needs to expansion of childcare, education, health care, and programs to ensure and affordable housing for low-income people. We continue to carry out our mission as the leader in meeting the needs of our Northern Kentucky community by providing services to residents in all eight counties. We will respond to the needs of the poor and, at the same time, continue our goal of helping people become self-sufficient.” Bob retired in July, 2011 and the Board promoted Tammy Weidinger to be the Center’s second President & CEO. Brighton Center played a key safety net role in the Great Recession that occurred from 2009-2012. With significant increase in demand for services in emergency assistance, workforce development, and foreclosure prevention, many services had to be reorganized to help families weather the crisis. In 2014, we continue to partner with families to recover from this difficult economic time in our history. Today in Newport, Brighton Center, Inc. operates the administrative offices and various other programs in the former West End Building at 8th & Central, the Family Center at 8th & Ann, the Center for Employment Training at 6th & Washington, the Early Childhood Education and Parenting Center at 7th & Park, the Two River Senior Housing complex on Brighton Street, Newport Commons on Ann St and Roberts St., and the Saratoga Phase 1 & 2 Senior Housing complex on Saratoga Street. Locations in Covington include Homeward Bound Shelter, Independent Living Program and the Austinburg Senior Housing complex. Kentucky Career Centers located in Covington, Florence, Williamstown, and Carrollton. In Boone Co., the Brighton Recovery Center for Women operates on Weaver Road and Early Childhood Education and Financial Wellness are provided on Shelby St.
Brighton Center is more than buildings and even more than programs and staff. After 52 years, its most tangible legacy is the hope and new life it has given to thousands in need in Northern Kentucky. The history can never be summarized by bricks and mortar, not as long as there are people, living testaments, to the work of Brighton Center. This work will continue into the future.